It’s my favorite time of the year: with the beauty of fall comes the opportunity to arrange your affairs within the framework of the law to pay only the correct amount of taxes in 2013—no more. Review Prior Filed Tax Returns for Errors and Omissions. One of the first things to discuss with your tax advisors at year end is whether all tax returns are up-to-date. Under CRA’s Taxpayer Relief Provisions, a taxpayer may recover taxes paid or refundable credits due to errors or omissions on prior filed returns for a 10 year period. This year do make adjustments to the 2003 tax return before December 31, 2013, as a minimum. That’s important because if you miss filing this return, you’ll be unable to recover and use unclaimed capital losses for 2003, deductions for carrying charges, creating unused RRSP contribution room on your earned income, or those missed carrying charges, moving expenses, medical expenses, and so on. Then, go ahead, request adjustments for missed provisions—or to file delinquent returns—for tax years 2004 to 2012. If the CRA owes you money, you’ll be more than set for Christmas. But if you owe, do pay on time, or make arrangements to pay over time. Review Quarterly Instalments: Is the December 15/31 Payment Required? If your income sources dropped in 2013 from their prior levels, you may not have to make the December 15 quarterly instalment payment. You should check that out with your tax advisor immediately. If it’s true, you can reserve that extra cash for RRSP, TFSA or other investment opportunities before year end. Farmers and fishers make one tax instalment payment on December 31 for the entire year. Once again, professional advice is a good idea. It’s Your Money. Your Life. Complete a preliminary tax return now to ensure that the final tax instalments of the year are required and take the time to also review prior filed returns to optimize your rights and preserve them, too, in cases where you have not yet filed. If you do it first, before CRA asks you, you’ll avoid expensive penalties. 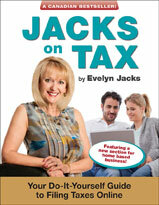 Evelyn Jacks is President of Knowledge Bureau and author of 50 books on tax and personal wealth management. She is also the founder and director of the Distinguished Advisor Conference (DAC). The theme of this year’s three day think tank in Ojai, CA Nov 10-13 will be “Back to the Future – Collaborative Wealth Management.” Follow Evelyn on Twitter at @EvelynJacks. It’s expensive to get an education, so investing in careers that “count” both financially and for your lifestyle in the future is important. If you are between the ages of 25 to 64 with a second or third language, strong analytical and communications skills, and enjoy ongoing learning, then work in the category of a “financial auditor” may be ideally suited to you, especially if you have a family. It pays well, too: average income for this group is just over $60,000—well above the average for all other income earners of just over $45,000. This information is according to the NOC (National Occupational Classification), which is Canada’s nationally accepted reference on occupations in Canada. The NOC organizes over 30,000 job titles into 520 occupational groups and descriptions. It’s a great way to find out more about occupations and jobs in Canada’s labour market. The NOC quotes Statistics Canada data, which indicates actual operating revenue (after inflation) in the accounting, tax preparation, bookkeeping, and payroll services industry has been outpacing economic growth for the last ten years or so, although this is expected to slow somewhat in the years to come. The high level of growth is explained partly by increased demand for accounting services and partly by the move among businesses to outsource these functions. When a business outsources its accounting and payroll services to a specialized firm, some employees move from the original industry to the accounting, tax preparation, bookkeeping, and payroll services industry. This means there is an excellent opportunity for those wishing to make the move from employment to self-employment in these fields. In fact, the proportion of accountants working in this “secondary” industry has risen from about 30% in the early 1990s to more than 40% in 2009 and 2010, according to data in Statistics Canada’s Labour Force Survey. The work of traditional accounting (auditing, assurance, compilation, review, bookkeeping, and payroll services) and taxation services (tax preparation, planning and consulting services, other taxation services) still represents 80% to 85% of revenues of firms in the accounting, tax preparation, bookkeeping, and payroll services industry. Knowledge Bureau, which provides convenient online courses taught at a post-secondary level, specializes in training in these industries. Now is a good time to earn the credentials as a certified tax practitioner or designated bookkeeper or business services specialist. It’s Your Money. Your Life. If you like the thought of being your own boss, working from home, or advancing your career as a “financial auditor”, consider going back to school this fall. You can start today, in fact. Filing a tax return is about what you keep. So is the pre-payment of income taxes throughout the year. This month that’s an important concept as the September 15 quarterly tax instalment payment is due on Monday, September 16. If you are an individual employee, the objective is to get the biggest refund possible—in other words, get the government to give back to you as much of the withholding taxes taken from your paycheque as possible. It’s your first step to incredible wealth. But if you are responsible for remitting your own taxes—because you have self-employment income, taxable alimony, large sources of investment income, and so on—the rules are the same. Be sure you pay only the correct amount. Current-Year Option: Under this option, you estimate your income tax liability for the current taxation year and, if the estimate exceeds $3,000, then one-quarter of the estimated amount is due on each of the four due dates: March 15, June 15, September 15, and December 15. Prior-Year Option: Under this option, the first two instalments are estimated at one-quarter of the taxes due in the second prior year (since the prior year’s return is not available when these instalments are due) and the last two instalments are calculated at one-half of the excess of taxes due in the prior year over taxes due in the second prior year. The CRA will automatically send you instalment notices using the prior-year method. If you make the payments as outlined in the instalment notices on time, no interest will be charged until April 30 even if the amount is insufficient to cover the taxes owing. If you use the current-year option and underestimate your tax liability (or if you fail to make the requested instalments), you’ll be charged interest on the late or deficient instalments as well as arrears interest. Think about it…if you are financially focused and invest that average tax refund of $1,659 you’ll get back every year over the course of your working lifetime—let’s say that’s 40 years—you will have $66,360 more in savings to live your dreams with. It’s Your Money. Your Life. Astute taxpayers know that when you do the math, over time, a six-figure sum could stay in your pocket to build your own wealth, rather than volunteering the amount to the government, interest-free. Last week I shared some tax tips that will help you as you plan your children’s activity agendas for the year. This week I provide some tips on claiming credits for others expenses such as child care, medical, and transportation as well as how to recover refunds or missed claims. Child Care Expenses: You may have enrolled your little ones in activity day camps while you work over the summer, but, the “prescribed” activities may not qualify for the credits described last week. Don’t despair, they may, instead, qualify for the deduction for child care expenses, which means you could get more bang for your buck. An increased Canada Child Tax Benefit is possible too. Child care expenses must be claimed by the lower-income spouse, with no benefit if one spouse is a stay-at-home parent, has very low income, or non-qualifying income (such as Employment Insurance benefits, for example). Where an activity qualifies for both the child care deduction and the activity tax credits, it must be claimed as child care expenses. The balance can be claimed via the tax credits. Because this is a deduction, not a credit, claiming a child care deduction will provide a larger marginal tax benefit, the higher your income. For example, at the top marginal tax rate in Ontario, you’ll get back close to half of your $500 costs, as opposed to a maximum benefit of $75 under the Activities credits. Medical Expenses. The unreimbursed costs for private health care insurance, glasses, braces and sports medicine, travel to health care services not available in your local community and a host of prescription drugs qualify as medical expenses on the federal/provincial tax returns. To claim for the best family benefit, do use the best 12 month period ending in the tax year, usually on the return with the lower net income (Line 236). That’s because medical expenses will be reduced by 3% of net income or a maximum reduction of $2152. (You’ll reach the maximum reduction limit when net income exceeds $71,733.) You’ll get a federal credit of 15% of the qualifying amount plus the amount based on the lowest provincial tax rate. For example, John and Cheryl live in Manitoba. John’s net income is $65,000 and Cheryl’s is $30,000. Their medical expenses for 2013 total $1,000. Since John’s claim is reduced by $1950 and Cheryl’s is reduced by $900, only Cheryl can make the claim. The $100 claim would only be worth $25.80 of real dollars to the family (only 2.5% of the $1,000 cost). Public Transportation. Don’t forget to save those transportation travel passes for a federal non-refundable tax credit of 15% of your monthly expenditures. All the travel pass costs can be claimed by one parent for the whole family. For example, your transit pass costs you $215 per month or $2580 per year. If you keep the receipts, you can receive $387 back on your tax return, assuming 12 months of travel ($2580 x 15%). Recover Refunds on Missed Claims. Add it all up and you may be richer than you thought come tax filing season. And, if you forgot to make any of these claims in the past, remember, you can always request an adjustment to prior filed returns. As there is a maximum 10 year period for most corrections, do so before December 31 to correct errors or omissions made in the 2003 and subsequent tax years. Those missed tax dollars from the past add handsomely to the replenishment of the “back to school” savings bucket for next year.